Lori M. Blank is Operations and Grants Manager at the Ray C. Anderson Foundation. 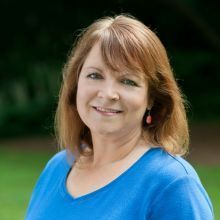 Prior to joining the Foundation, Lori worked in online media, providing support to GreenShortz and Southeast Green, two web-based 'green' media channels. She also honed her materials management skills while completing a Summer Internship with the Georgia Recycling Coalition. Volunteer project work with The Sierra Club, EarthShare of Georgia, The Nature Conservancy, and the Zero Waste Business Council also provided an outlet for her environmental commitment. Before deciding to change careers and explore her passion for the environment, Lori was actively involved with several non-profit organizations, both in managerial and volunteer capacities. She served two terms as Vice President, and was a founding member of the Alumni Advisory Board at Oakhurst Cooperative Preschool, a nature-based learning environment for young children. At OCP, she was instrumental in developing and managing the school's Summer Camp and Enrichment programs, created and piloted the Tuition Assistance Program (TAP), and chaired the school's annual Fundraising Auction. Upon her daughter's graduation to elementary school, Blank became active in the school's PTA, serving on the Health & Wellness Committee, co-creating the Sustainability Committee, and establishing a bi-annual 'Farmers' Market' which featured harvest from the school garden. Prior to her time as a stay-at-home mother, Blank was a successful marketing services executive, providing research, branding, and CRM expertise to Fortune 50 packaged goods clients, including The Coca-Cola Company, Nestlé, PepsiCo, and Nabisco. Seeking to launch her "second" career, she completed the Certificate in Sustainability Leadership through Emory University's ECE program. Lori also earned an MBA from Georgia Tech, and received a Bachelor's degree from the University of Florida. A college football fan and avid nature lover, she resides in intown Atlanta with her husband, daughter, and two large, fluffy dogs.